It’s rare that a company stumbles badly and leaves investors questioning its future. But, that’s the case for Facebook (Nasdaq: FB) recently. The company’s latest stumble involves the illicit use of data to develop an election strategy. Cambridge Analytica, a firm known to just a few political activists weeks ago, is now causing problems for Facebook. The company violated Facebook’s policy to provide information to parties in elections. Details are incomplete, but so far the research firm seems to have worked with at least the Trump campaign in the United States and the group supporting leaving the European Union in the United Kingdom. The results of those two elections surprised the experts who have been looking for answers to what went wrong. Facebook has been a prominent target of these experts struggling to understand how they could have missed such significant trends. While the problems in the news concern elections, Facebook has been in a decline for some time. 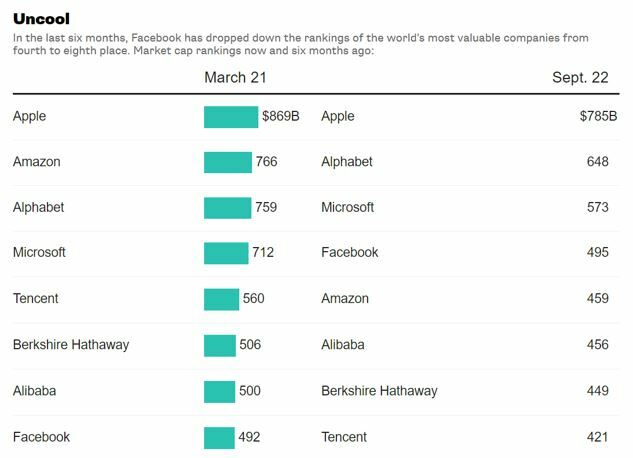 The chart below shows that just six months ago, it was the fourth most valuable company in the world. Now, it is declining in value as its competitors grow in size. This is a rather recent trend as the stock’s long term chart shows. Facebook has been a market leader for years, pulling back when the broad stock market did so but generally moving higher. In the past six months, the stock lost its momentum and the company, at least according to some analysts, is struggling to recover its own momentum. The gains came despite some high profile mistakes the company made in recent years. There was that attempt to introduce free internet access in India that failed because the users wanted more than the limited access Facebook planned to provide. Norway’s Prime Minister accused the company of attempting to censor history. Then, there were accusations that the company selectively censored some news outlets based on their political leanings. And, of course the initial response to the election problems when the head of Facebook, Mark Zuckerberg rejects ‘crazy idea’ that it swayed voters. Facebook is, most likely, able to survive this series of missteps. The stock is also likely to recover in the long run. There may be increased regulation and costs of compliance and that could slow earnings growth. But, disaster seems unlikely in the long run. In the short run, there is unlikely to be a significant rally in the stock. It will take time for traders to gain confidence in management to address these issues. That creates a trading opportunity. For FB, we have a number of options available. Short term options allow us to trade frequently and potentially expand our account size quickly. Short term trades also reduce risk to some degree since there is less time for a news event to surprise traders. In this case, we could sell an April 20 $170 call for about $1.55 and buy an April 20 $172.50 call for about $1.10. This trade generates a credit of $0.45, which is the difference in the amount of premium for the call that is sold and the call. Since each contract covers 100 shares, opening this position results in immediate income of $0.45. 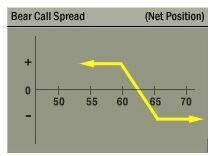 The credit received when the trade is opened, $0.45 in this case, is also the maximum potential profit on the trade. The maximum risk on the trade is about $205. The risk is found by subtracting the difference in the strike prices ($250 or $2.50 times 100 since each contract covers 100 shares) and then subtracting the premium received ($45). This trade offers a potential return of about 21% of the amount risked for a holding period that is about one month. This is a significant return on the amount of money at risk. This trade delivers the maximum gain if FB is below $170 when the options expire, a likely event given the stock’s trend. Call spreads can be used to generate high returns on small amounts of capital several times a year, offering larger percentage gains for small investors willing to accept the risks of this strategy. Those risks, in dollar terms, are relatively small, about $205 for this trade in FB.